The Monumental Chapel bell tower, officially known as the Frank E. Brown bell tower, will soon be undergoing a restoration and renovation process due to structural insecurity. Plans for the process began in October, structural work will begin in May and work on the outside of the tower will begin this summer. Bands will be put around the outside of the tower, which will connect to each other and pull the tower together. From there, non-corrosive steel crossbars will be inserted through the middle of the tower. The bands will later be covered by the new façade, which will include elements from the current and new designs. The first 25 percent of the tower, starting at the bottom columns, will be white sandstone with capstones. Wesleyan red brick will cover the rest. 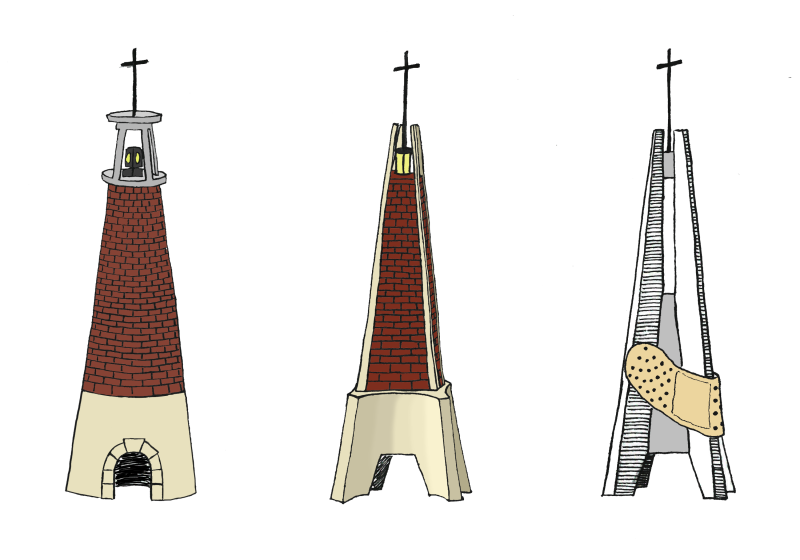 A beacon with a light will be placed near the top of the tower, which will also include the sound and chime system. The cross will be moved to peak, in the same position that it currently sits. Greg West, the current Chaplain for the university, looks forward to the change. He said that though the tower may change in appearance, what it symbolizes for the campus will remain the same. He expressed a wish that the new designs would take into consideration his idea for ‘baptism from above,’ which would involve West standing at the top of the tower and pouring water balloons on people standing below. “I haven’t pressed it, but maybe I could talk to them as they design the new thing and have a little perch for me,” he joked. The tower does currently have a ladder that leads to the top, although the ladder is only used for maintenance purposes. The structural problems were first noticed in 2015, when a $350,000 planning grant that included a facilities condition assessment noticed that the metal on the inside of the tower was badly rusted and the connecting bolts were corroded. The initial analysis stated that the tower would need to be fixed within five years, while a secondary analysis gave a three- to five-year period. The 10-year master plan that was released a year later included a plan for corrective maintenance. This plan, among other documents, was released to the Board of Trustees and a select number of donors. The last time the tower underwent construction was in the late 90’s, when an anonymous donor sparked a revival of musical selections for the tower. One student reported hearing famous tunes from Oklahoma! while others recognized more traditional church hymns. Music was first introduced in 1975 when a carillon was gifted to the then-college. A carillon is a set of cast bells that play chromatic scales. According to a past Marlin Chronicle article, the original carillon was a tube-type amplicator donated by the Mutual Federal Savings & Loan Association in memory of the bank’s former president.